Spring arrived this past Thursday but our day in court did not! After a group comprised of permanent SRO tenants of The Alexander, community leaders and a half dozen attorneys (only one for N90s!) sat through arguments for other cases, the presiding judge recused himself from the case. The next step: The Supreme Court must assign a new jurist, then the lawyers for the landlord, shelter operator, four City lawyers and our own Stewart Wurtzel of Tane Waterman & Wurtzel P.C. must coordinate schedules to set the next date. We will announce the new court date asap. See you in court! Thomas Heard’s Bronx neighbors have been subjected numerous times to the 37-year-old’s rants against white people. Remember when every corner of West End Ave and Riverside had a litter basket? It wasn’t long ago – we’re talking Spring 2018. Now the Bill de Blasio Department of Sanitation has issued a veiled threat to take all the baskets away if they don’t like what’s in our trash! 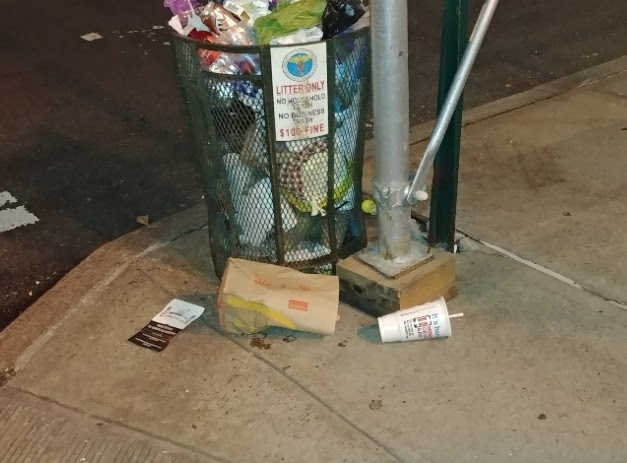 The unannounced removal of two corner cans at several intersections – only two remain on alternate corners – has resulted in an unhygienic, unhealthy, overflowing mess. But Sanitation, under the leadership of Commissioner Kathryn Garcia, is not only tone deaf and blind to this policy of returning our neighborhood to the days of filth and feces, they now claim we don’t need any public litter cans at all. Thus, Sanitation is saying that it is at their discretion that we have any litter baskets at all! Ms. Barreto’s response was initiated by a letter to Mayor de Blasio. A neighbor complained that there are but two cans on the corners of West End and 95th Street, where two public schools are co-located. The removal of two cans has created a filthy disaster. “Sanitation has chosen not to engage the community,” says Aaron Biller, president of Neighborhood In The Nineties. “If Sanitation believes that people are not using litter baskets properly, they could have enlisted elected officials and the community board and educated the public through the media. Instead the baskets were removed with no warning. The City now treats our neighborhood, which has dozens of schools, institutional facilities, Riverside Park, and mid and high rise residential buildings like a sparsely populated single home community in Staten Island. 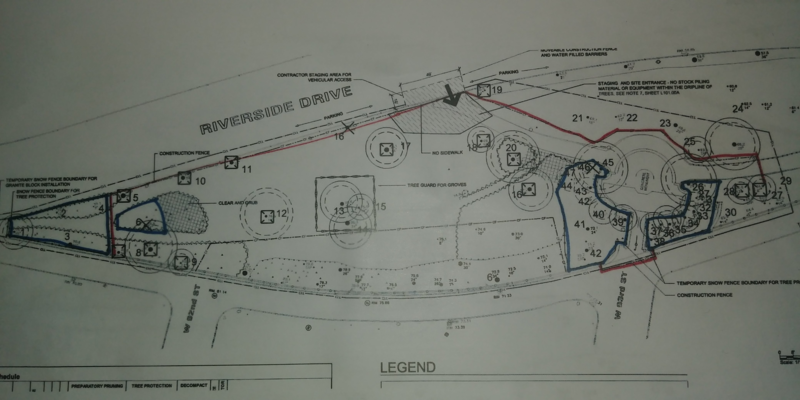 Looks like the long-sought plan to restore one of the City’s landmark statues and most of the surrounding park will break ground in the next few weeks. “The life-size bronze figure of Joan of Arc standing tall in the saddle with her sword drawn was the first statue in New York depicting an actual woman (previous statues had honored fictional women. ),” reports writer Leslie Albrecht. If City streets throughout the five boroughs seem scary at times, while stories of dangerous conditions in homeless shelters abound, it may be because shelters are taking the place of jails and dedicated mental health facilities. Robert Mascali, a former deputy commissioner in the NYC Department of Homeless Services makes some sensible recommendations in the Sunday Daily News op-ed page. Donations to the N90s Security Patrol, and the Legal Fund for fighting the proposed shelter at The Alexander, may be made via PayPal at our website, www.N90s.org. Please note which program you are supporting. Encourage your building or tenants’ association to donate to support these N90s programs. Attorneys are expensive, security patrols are also expensive. Volunteers at N90s are not paid, not a single one of us! Help us fight for a safer neighborhood. The N90s Newsletter may be subscribed to for free, at Info@N90s.org or via our website, www.N90s.org — but you must live or work in our neighborhood. ← N90s: Back In Court Thurs AM; Congestion Pricing: Are We Protected?